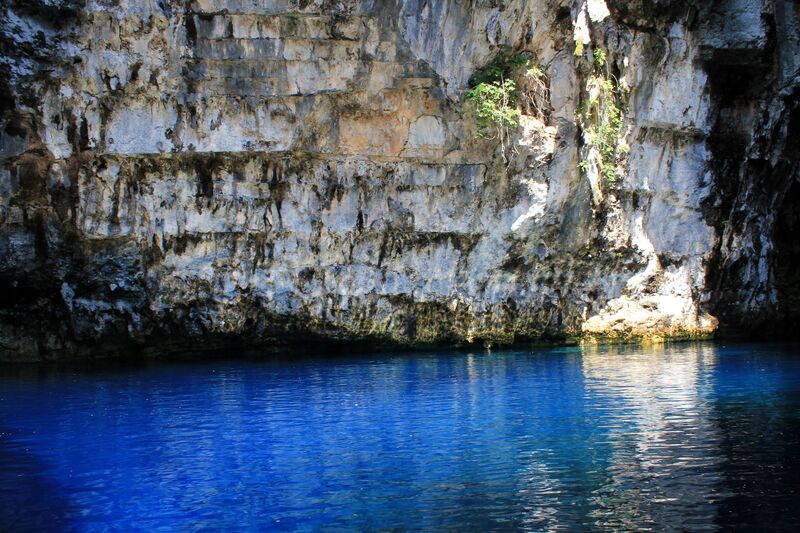 To the outside world, the Greek island Kefalonia (Cephalonia) is probably known mostly (if at all) as a sister island of another one, much smaller but immortalized by Homer – island of Ithaca. Kefalonia may be also remembered as a helpless victim of the powerful earthquake that in 1953 turned to rumbles about 95% of islands settlements. All that was left from periods of Venetian, Ottoman, French and finally English rules shared the fate of archeological artifacts from Mycenaean period eventually finding its way to local museums. 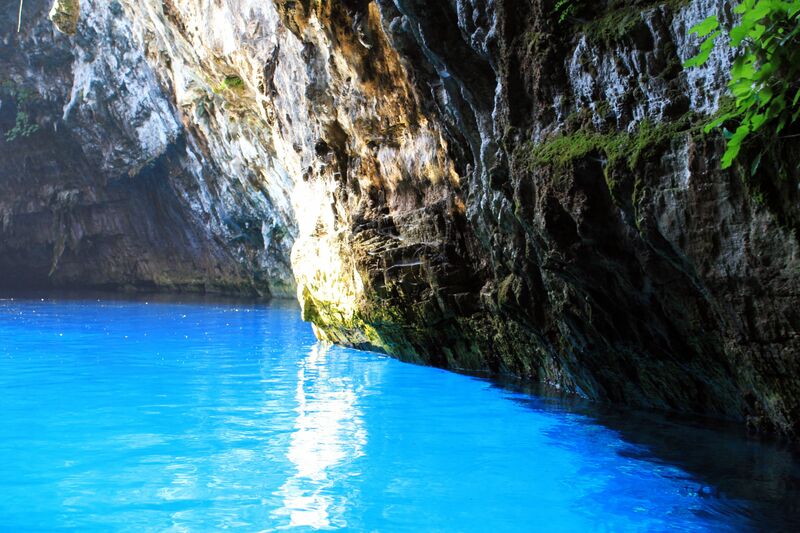 But fortunately despite such disasters Kefalonia preserved its natural jewels such as for example Melissani Underground Lake (not mentioning Drogarati caves, Myrtos Bay and rich natural environment). 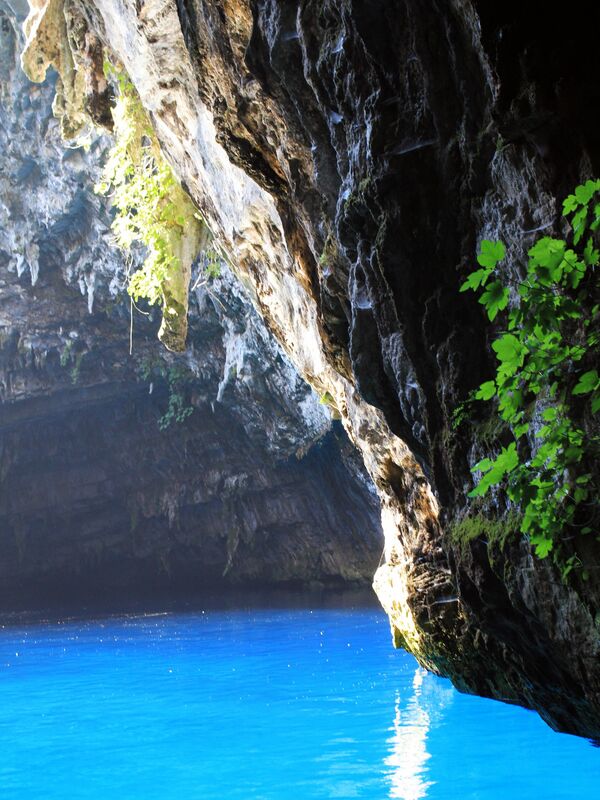 Recent archeological excavations proved, the Melissani Cave was known to ancient Greeks already during the early Hellenic Period (4th-3rd century BC). 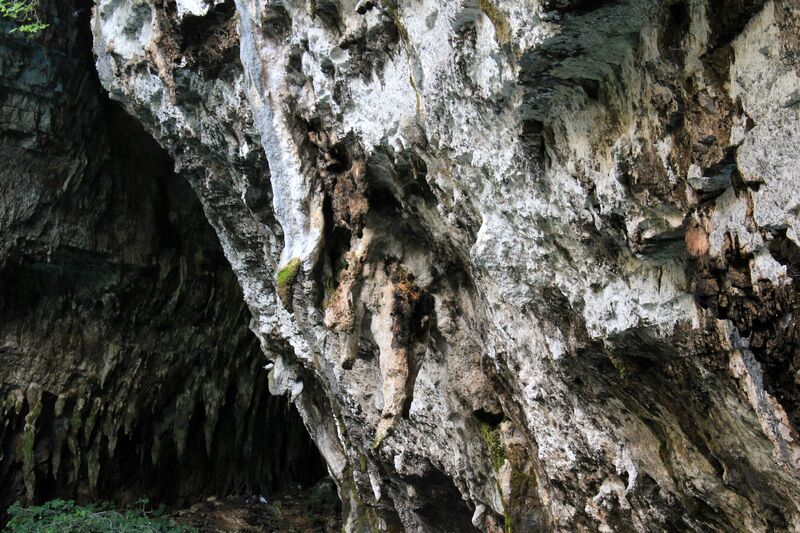 It seems that the cave was used as a place of worship for mythological god of the wilderness - Pan and his “entourage” of nymphs. 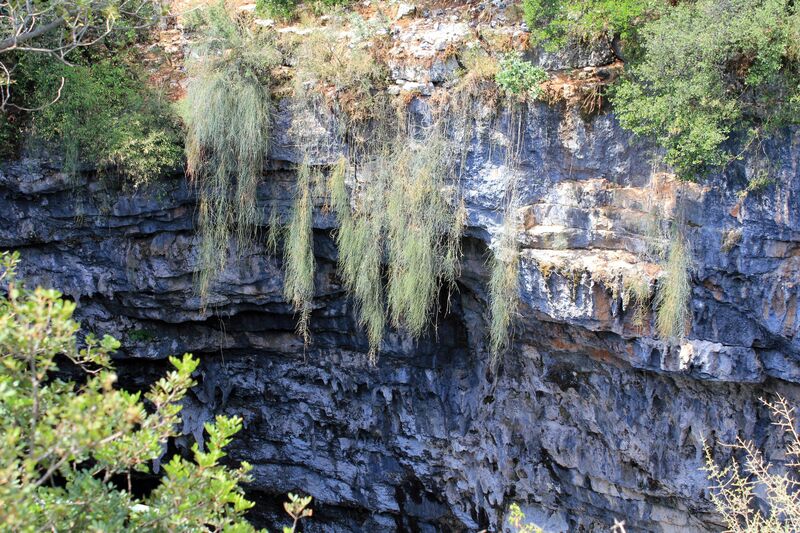 But then the cave got forgotten and unknown even to local inhabitants. Not much can be said as you stay speechless at the shore - this pictures shows it all! In more recent times however, due to mysterious disappearance of some shepherds searching for their lost sheep, inhabitants of Sami started to suspect the presence of an “underground world” near Sami. 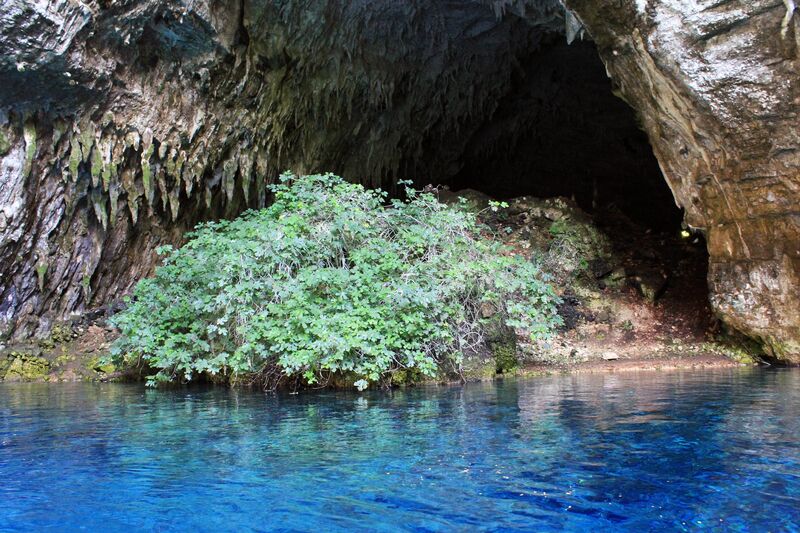 It wasn’t then big surprise when in 1951, after more than two thousand years of secrecy, the underground cave and lake were (re)discovered by the famous Greek speleologist Ioannis Petrocheilos. 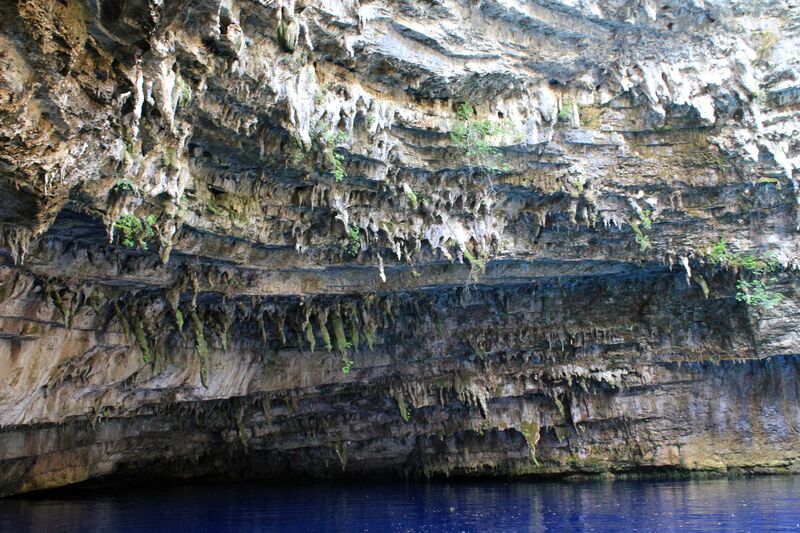 The cave was created over millions of years by tedious works of nature. 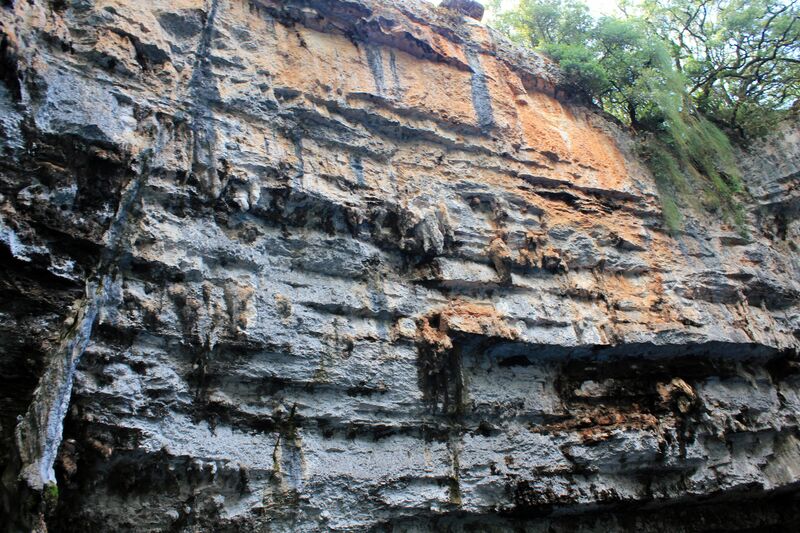 In a process of erosion called “karstification” water was dissolving soft limestone bedrock carrying it away to the sea. 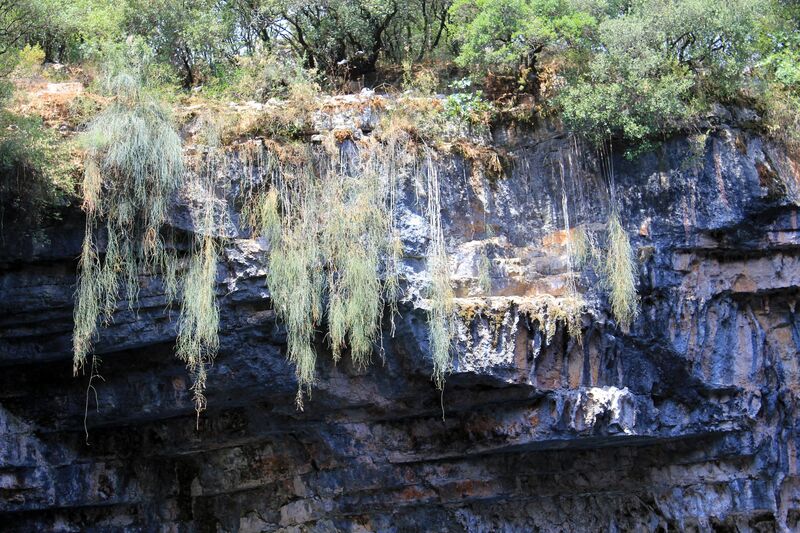 During such process small seismic cracks slowly grow to sinkholes, swell to caverns and finally expand to immense caves, while leaks of minerals rich rain water give birth to stalactites and stalagmites…. The Mother Nature jealously kept her secret in darkness till the “work was fully accomplished”. Then, when the devastating earthquake struck the island, the roof above the cave partially collapsed creating a vast opening. 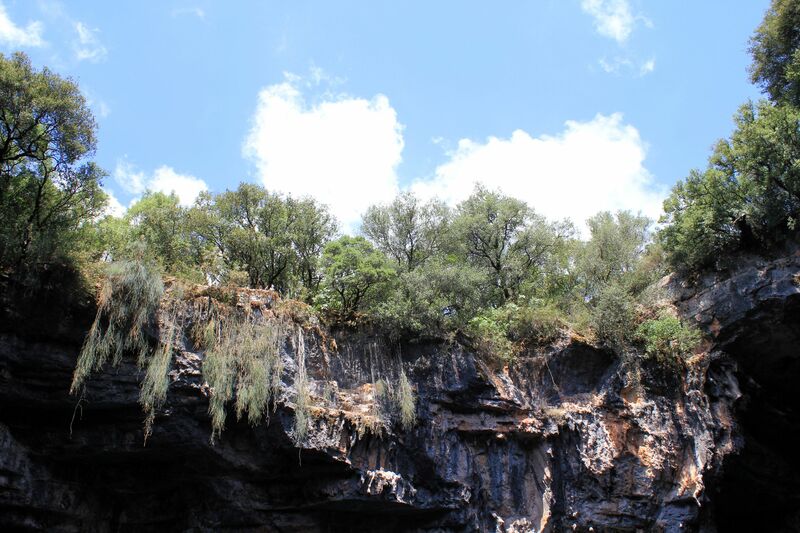 One could say – the nature, possibly feeling the guilt for all destruction brought to the island, gracefully revealed the underground world that became known as Melissani Lake. 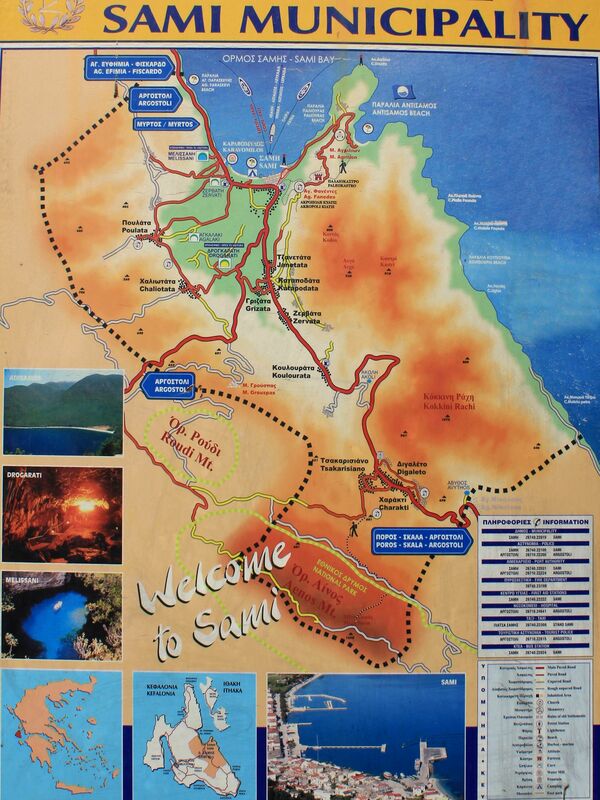 Map of Kefallonia - area of Sami where the Melissani cave and lake is located. Not surprisingly the name of the lake comes from Greek’s mythology. 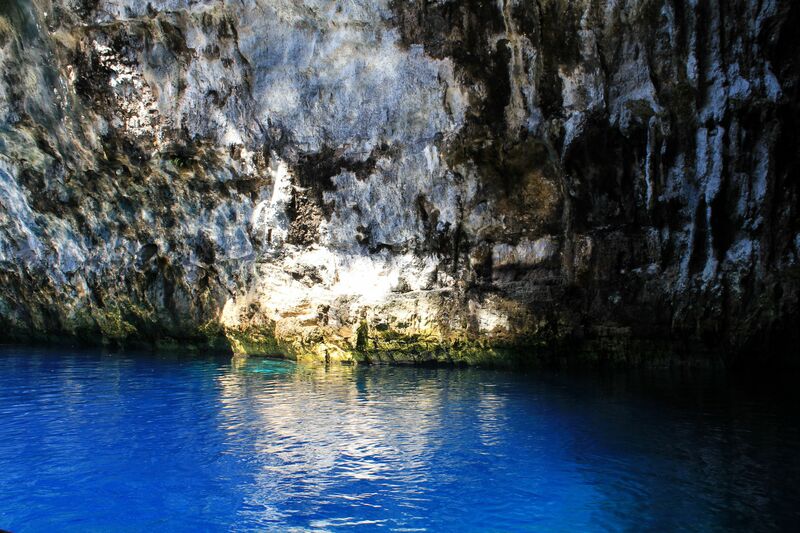 Traditionally nymphs were living in lakes and to one of them named Melissanthe, the underground lake was dedicated. 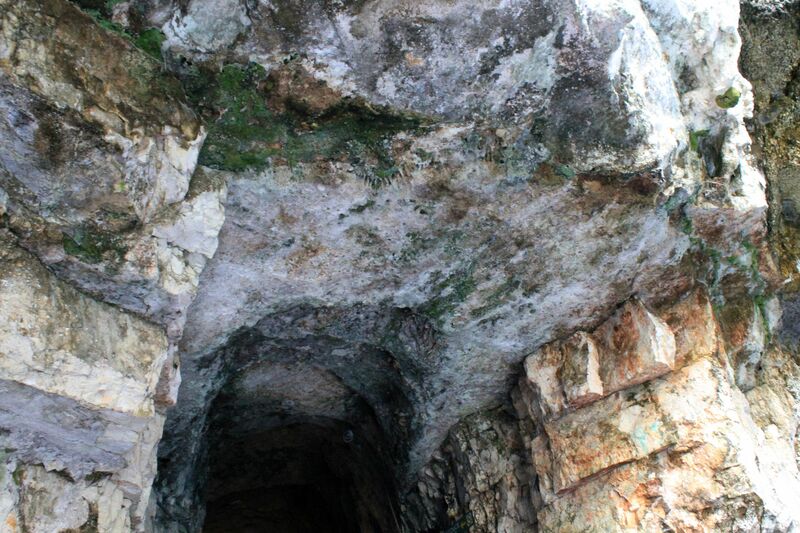 The site located near small village Karavomilos (next to the town of Sami) consists of two contrasting chambers. 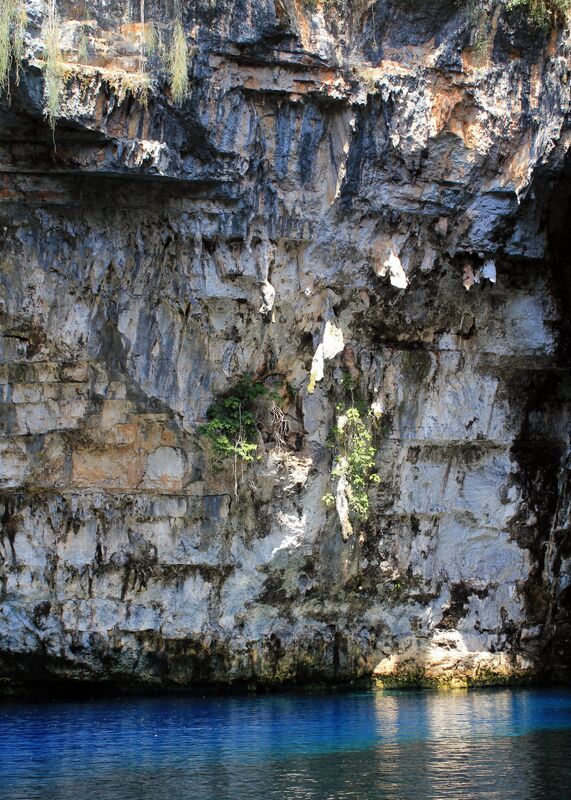 The first one, opened to the sun looks like typical “cenote” similar to those dotting the Yucatan Peninsula (although most likely cenotes were created not by erosion, but by an explosion of a giant asteroid over the Gulf of Mexico some millions years ago). 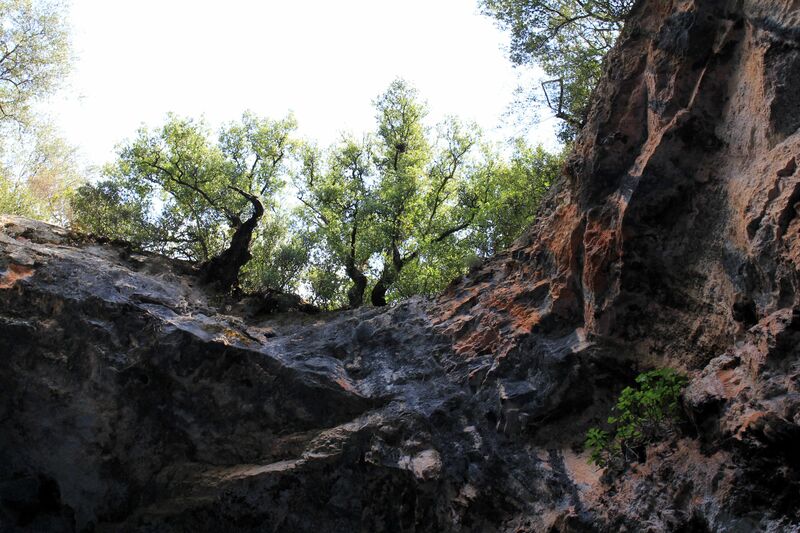 The second one is covered by natural rocky roof so darkness is its prevailing ambiance. Few lonely electric lights expose abundant stalactites and stalagmites enhancing cave’s atmosphere. Between both chambers lies a small island living only narrow water passage. The length of both chambers comes to around 500 ft ( 50 m) , width about 130 ft (40 m) while the water’s depth reaches 128 ft (39 m). 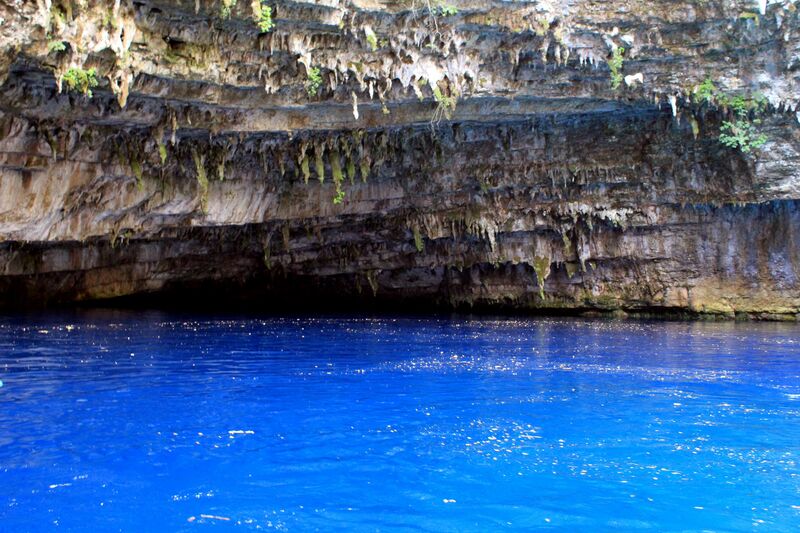 The Melissani lake is a living proof, that even indisputably “bad event” may still have some “bright side effect”. 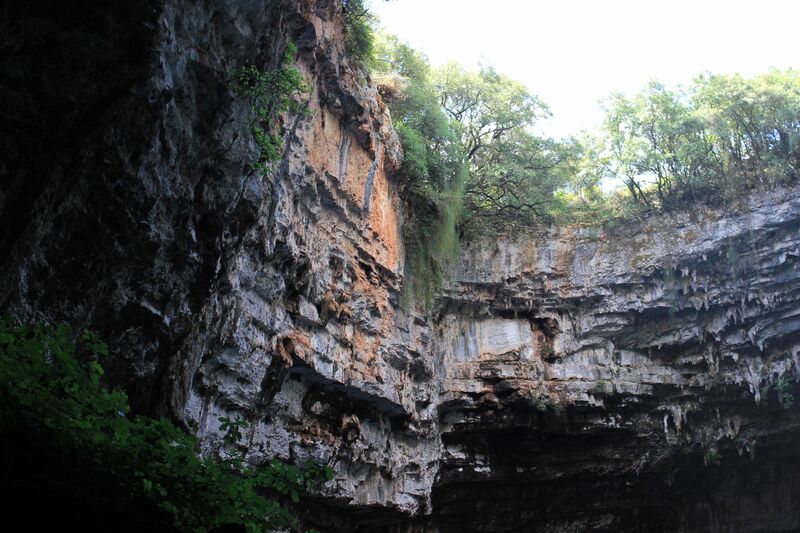 And this is exactly what happened here – collapsed roof gave the totally new life to the cave and lake. 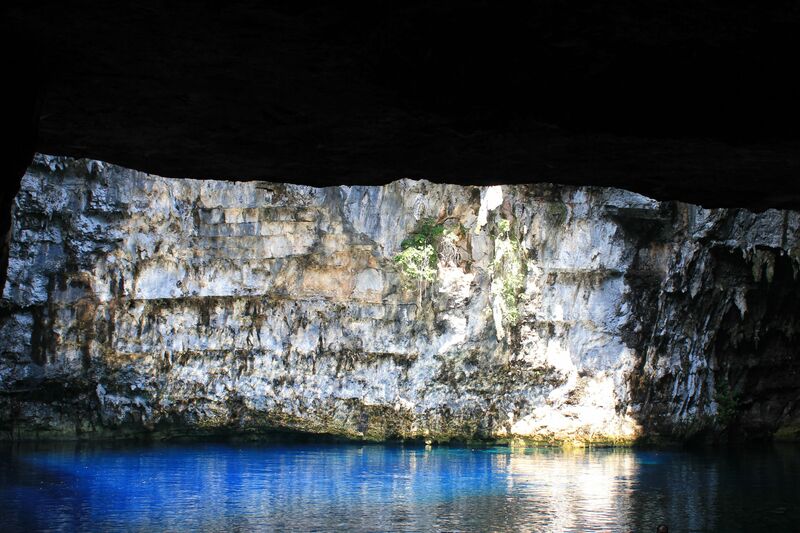 And this is because exposed to the sunlight lake’s water and cave’s walls were able to offer mind-blowing spectacle of colors, impossible to experience in the secrecy of total darkness…. Lake’s water is a mixture of salty sea water penetrating island’s fissures and sweet water supplied by underground streams. Apparently it is this combination that creates the magical spectacle of colors. Reflected and dispersed sunlight displays surprising spectrum of bluishness, from light to vivid blue. However it is not a sky-like “smooth” bluishness, but a vibrant one, glittering, seemingly sparkling…. Exposed rocky walls add their own charm to these fabulous colors. 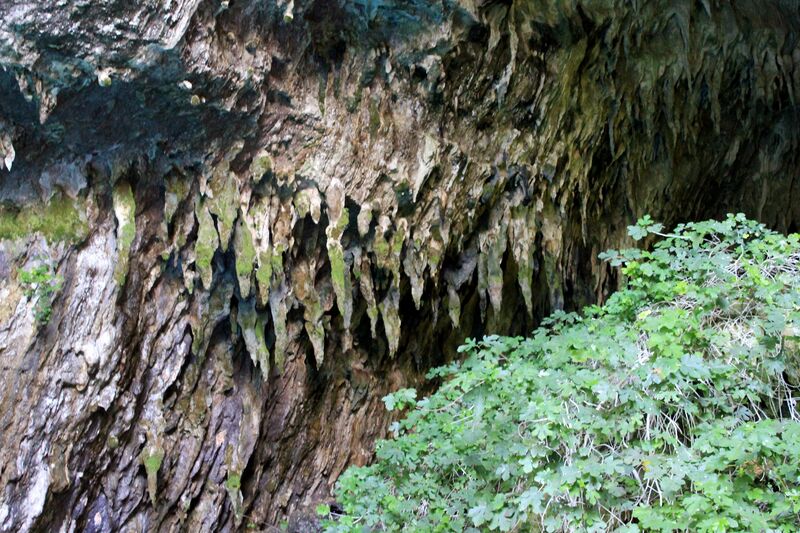 Whitish layers of limestone here and there tinted with reddishness of ochre and “painted” with contrasting green shades of moss open new dimensions to this fairy-tale’s world of the cave. Hanging vegetations from the edge of the “opening-hole” and visible trees up there provide soft transition from the underground world to as far as the sky…..
To fully experience these magical effects of light and colors it is suggested to visit the lake during sunny days once the sun reaches higher position on the firmament. However, visiting the site earlier morning or later afternoon by no means deprives visitor from experiencing its unique atmosphere. It may be just offering different hues and sending different vibes…. Sharing this natural beauty with tourists! To share this breathtaking beauty with tourists, in 1963 the tunnel was cut in the rock allowing an easy access to the lake. 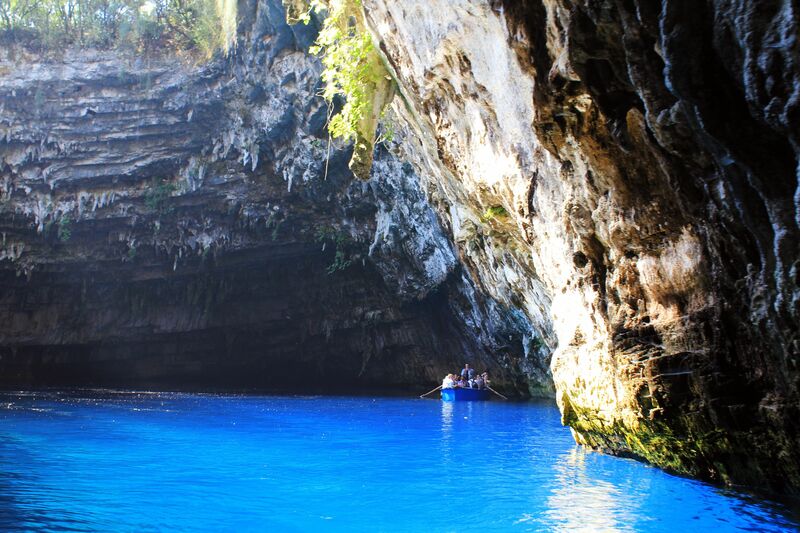 Since then Melisanni Cave became one of Kefalonia’s top tourist destination. 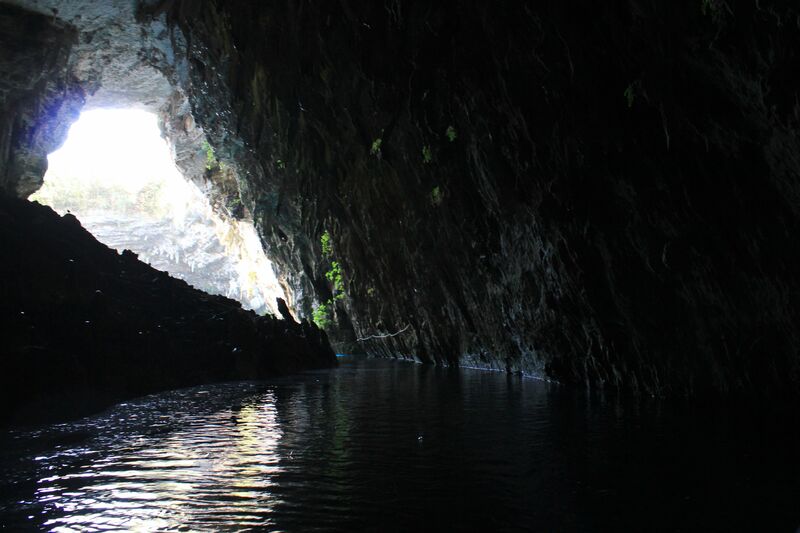 Visitors can take a short boat tour on the lake’s turquoise waters then enter the second cave through the narrow water passage to marvel in semi-darkness at strange shapes of the true underground world…. 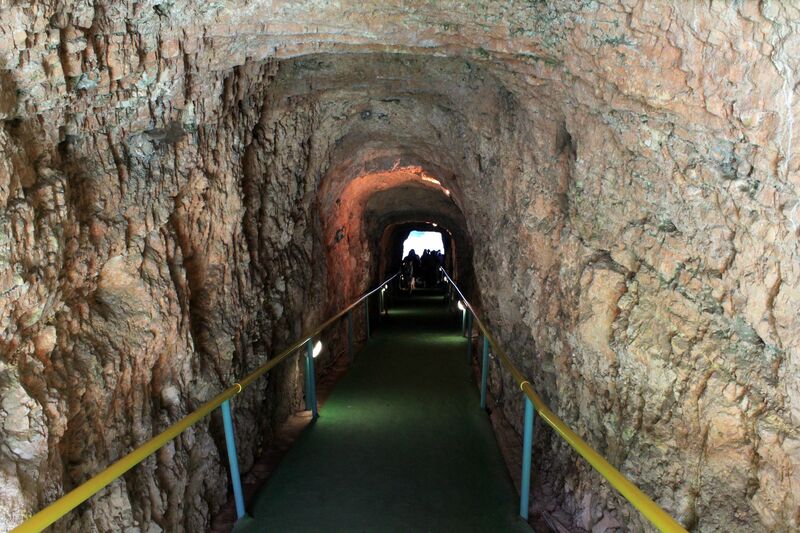 It’s totally different experience, something like crossing the boundary of two worlds…..
On the surface, near the cave’s opening created by the collapsed roof there is a balcony built to allow visitors to have a different “angle of view” on the cave. However, these days for unknown reasons the entrance to the balcony is closed! One more note - wedding ceremonies are organized on the lake! It’s not surprising given that it is one of those Magical Mystery Tours…. Just imagine “sailing” on the bleu waters (what actually feels like “gliding” suspended in the light) to the tunes of some love-songs! Wow! 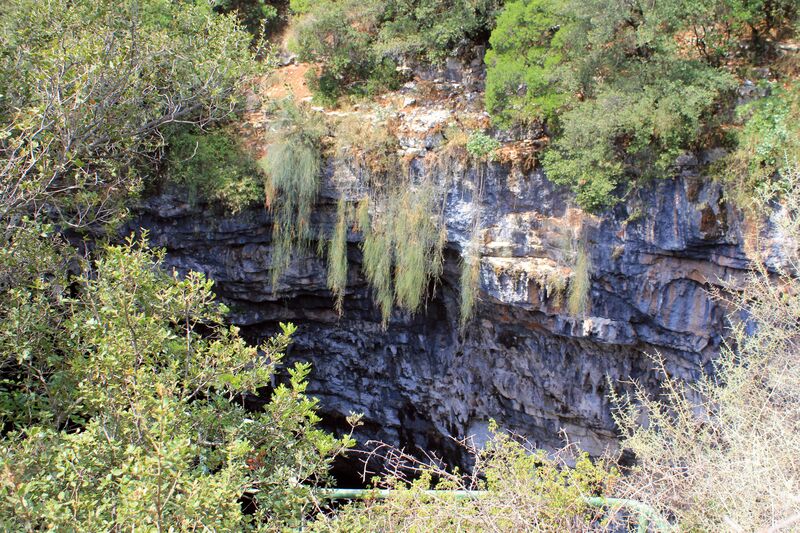 I wish I knew about the Melissani cave earlier in my life!